Eastfield enjoyed a 6-3 victory over Stag B in Portsmouth Men’s Summer League division one, writes Lee Todd. Dave Smith won the opener for Stag despite his opponent, Neil Silvester, scoring 180. Eastfield then took control as Paul Emeney, Vic Smith and Paul Garland moved them 3-1 up. Liam O’Driscoll and Danny Browne restored parity for Stag. But that was all they could muster with Kevin Wilson, Paul Easterbrook and Phil Rudder taking the remaining sets to give Eastfield the match. Duke of Devonshire B opened up a two-point lead at the top of division three as they dispatched second-placed Graham Arms 5-4. Duke took a 3-1 lead through Steve Houghton, Peter Neale and Kevin Gamblin after Allen Duffin had opened proceedings. Nigel Young scored 180 as he pulled a leg back for Graham before Robert Houghton moved Duke to the brink of victory. But Graham refused to roll over. Dan Williams and Rob Knowles were both on the mark to square the match at 4-4 and force a deciding leg, which Sam Malone won for Duke. Despite being two players short, Rose in June A beat Stag A 5-4 to move off the foot of division four. Stag were gifted walkovers for Brian Hammond and Mick Neilson and sat 2-0 up before Malcolm Sparks won the first leg of the night. Andy Dunn made it 3-1 but Matt Benfield was on hand to pull a leg back for Rose. Tom Jeffery put Stag within a leg of victory. But it was one-way traffic from there on with Dave Holton, Graham Turner and Ian McClaren taking the remaining ties to give Rose the match. Barry Stevens (Admiral Drake B) and Fon Owen (Rose in June C) both threw 16-dart legs, while Phil Harty (Admiral Drake B) notched a pair of 17-darters and two 180s. Ian Pearce (Rose in June B) registered a 17-dart effort and 180. Meanwhile, Daniel Jafkins (Rose in June C) finished a leg in 18 darts. Gary Smith (Jolly Taxpayer C) hit a 100 game-shot. His Jolly Taxpayer C team-mate Steve Humby fired in a maximum. Gavin Carlin claimed top honours in week two of the Portsmouth Individual League. 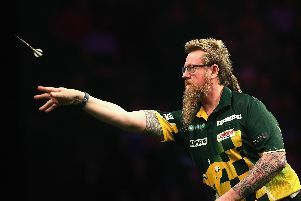 He beat Simon Whitlock into second place. Rob Collins lost out to Carlin in the semis, while Whitlock beat John Large. Justin Bradshaw triumphed in the plate – with Charlie Large finishing as runner-up. Bradshaw reached the final by beating Dan Jafkins in the previous round and Corrie Hammond reached the last four. Whitlock and Matt Charman fired in 170 finishes. Carlin hit four 180s and an 11-dart leg.